Ripple continues to trade inside its longer-term ascending channel but has formed lower highs and higher lows to consolidate in a symmetrical triangle. Price is hovering around the resistance and a break higher could confirm the bullish momentum. The 100 SMA is above the longer-term 200 SMA to signal that the path of least resistance is to the upside. In other words, resistance is more likely to break than to hold. The moving averages are also close to the bottom of the triangle to add to its strength as support in another dip. An upside break from the triangle could spur a rally that’s the same height as the formation, which spans .4500 to around .7500. Ripple could encounter near-term resistance at the mid-channel area of interest at .6000 and the channel top at .7500. Stochastic is already indicating overbought conditions and is starting to turn lower to suggest a return in selling pressure. This could lead to another dip to the channel bottom or triangle support before more buyers rush in. Ripple has been one of the more resilient cryptocurrencies after the latest market slide, even overtaking Ethereum in the rankings based on total market cap. Positive developments for Ripple keep XRP supported as traders continue to look forward to the xRapid platform serving big financial institutions and leading to strong volumes down the line. Still, there’s a lot of uncertainty hanging over the markets this week as the Bitcoin Cash hard fork “mining war” continues. Many are worried that similar issues could arise for other altcoins in the future, weighing heavily on their values as the community fails to reach a consensus as well. For now, the “flippening” continues to be the main buzz for Ripple on social media and some are predicting that it might even overtake bitcoin at some point. 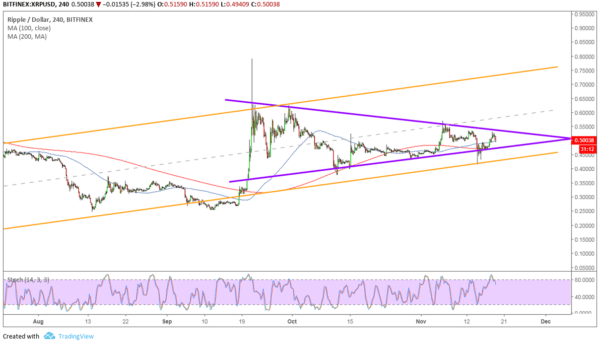 The post Ripple Price Analysis: XRP/USD Triangle Break to Confirm Upside Momentum appeared first on Live Bitcoin News.